Reading this last part aloud really struck me and has stuck with me. And soon after, I wondered, how do I convey this grand love to my kids? How can I make them understand God’s love for each of them when I have a hard time grasping the scope of it myself? 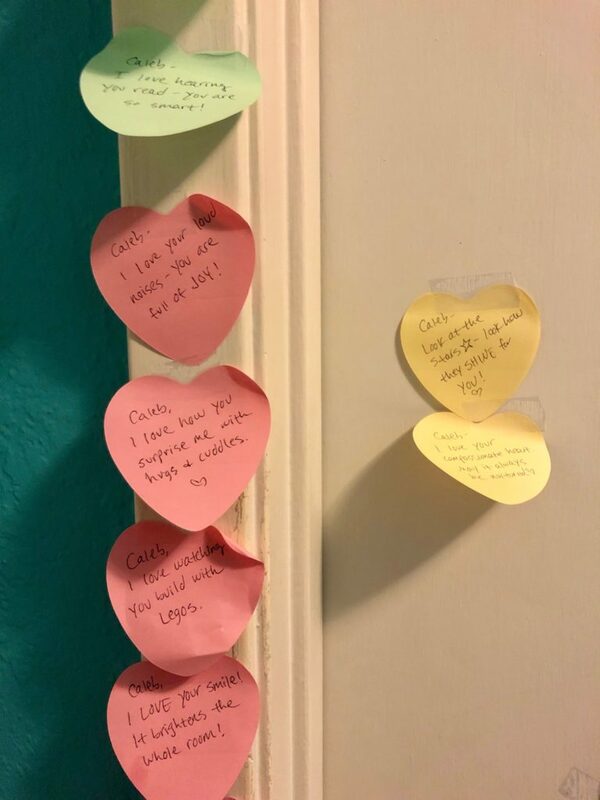 Thanks to some posts on social media for the lovely idea, this year I decided to post a little heart-shaped sticky note to my sons’ bedroom doors, one per day beginning February 1 through Valentine’s Day. 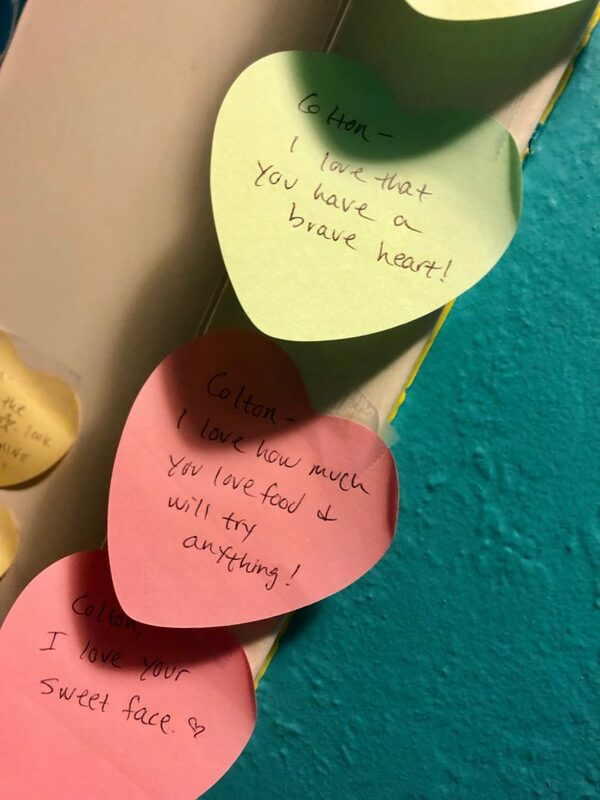 Each heart sticky had a hand-written thing/attribute/trait that I love about each child. 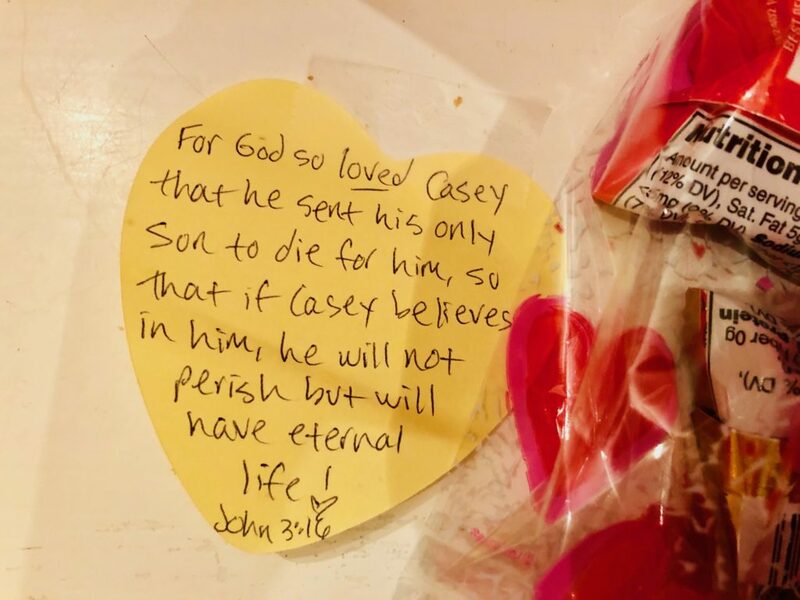 Casey – I love that I can still hold you, and that you still want me to. Caleb – I love how loud you can make our home. I know you are full of joy! Colton – I love how you tell me you miss me and give me a “big hug” every day. The notes lined the doorways or covered the front (out of reach of a certain three-year-old’s hands). I was often asked to read them to the boys, or if I had already placed the new heart for that day. Yes, I would say, go look. Eventually, 13 hearts for each boy. Knowing the oldest would be only the one who could read the last note by himself, I awaited his reaction and the others’ requests to please read the note. I told them for this last heart sticky, I chose the ultimate love note. I told them the bible may be God’s love story for us, but this is his love note to us. One we can tuck away in our hearts, much like we tuck away notes in lunch boxes. There was no audible response, but comments and questions may come later. On this day to celebrate love though, I hope that reminder of God’s grand love resonated deeply within them.